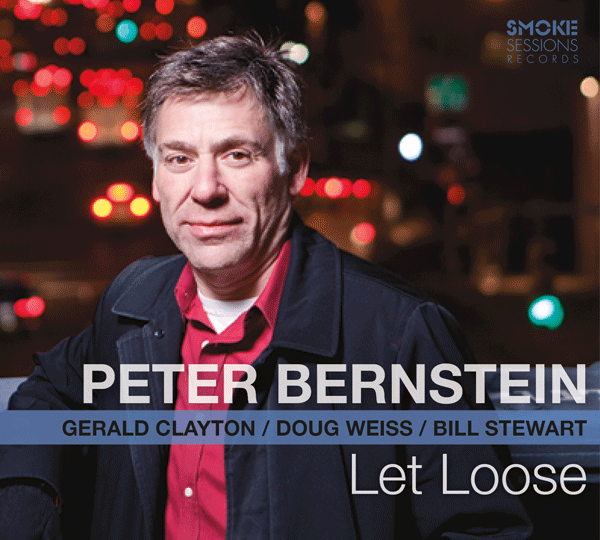 Jazz guitarist Peter Bernstein, who’s been one of the most in demand 6-string axe masters for the last 20 years, does indeed “let loose” on his brand new Smoke Sessions recording. With his young and very able quartet, Bernstein navigates a combination of clever originals and slyly offbeat covers, giving everyone plenty of room to thoroughly express themselves throughout the project. Bernstein, with 80+ recordings to his credit as both a leader and a sideman, is equally adept as a composer and as a soloist. It’s a tossup as to whether his improvisational skills bring out the best in his compositions, or his compositions give form to his solos. The melody of the title track has a very Coltrane-like intervallic feeling as you can almost hear Trane’s crystalline tenor sounding out the head. Gerald Clayton (son of bassist John Clayton and nephew of saxophonist Jeff Clayton) lays down McCoy Tyner-like block chords at the piano underneath the guitar that serves as a springboard for solos that skitter over the churning rhythm. There’s a buildup of tension that only releases as each soloist concludes their thought. “Hidden Pockets” (another Bernstein original) has a floating, almost rubato intro as the guitarist seems to meander around with Clayton’s piano shadowing his every move. With the stroke of drummer Bill Stewart’s stick on snare, the tempo rockets forth into a rollicking toboggan ride down a steep mountainside with all four members letting out all the stops. The title of the tune comes from a line in the poem “Only You” by 13th Century Persian poet Rumi. I’m sure he couldn’t have envisaged what his thoughts sparked this many years later. Cuban composer Osvaldo Farres’ “Tres Palabras” is known from the Nat “King” Cole rendition, but Bernstein and his crew give it a brand new interpretation that has a simmering swing and a gentle, breezy feel. Gerald Clayton, who serves extremely well as Peter Bernstein’s foil and also his musical compadre, utilizes a series of chords in descending patterns that just jumps out during his ride, and gives Bernstein a chance to dive in while the action is high. Peter Bernstein came on the New York jazz scene in the late 80’s. He got an early break when legendary guitarist Jim Hall invited him to participate in his Invitational Concert @ the 1990 JVC Jazz Festival with aces John Scofield and young lion Pat Metheny. Since that time Bernstein has gone on to play with alto saxophonist Lou Donaldson, Sonny Rollins, Lee Kontiz, Dr. Lonnie Smith, Joshua Redman, Diana Krall and many, many others. His reputation as an A-list cat in the Apple is sterling. “Lullaby for B,” (written for his young son Bruno) is a charmer in three-four time. The lovely little head is befitting a precocious little guy who’s full of mirth and hijinks; while the solo section gives drummer Stewart ample opportunity to work over his entire kit and to provide traction for the rest of the ensemble to dig in. The disc concludes with Kurt Weill’s “This Is New” and has that relaxed swing that dominates this set of tunes. Bernstein’s constant technique of slurring notes (sliding into and out of, rather than striking it individually) gives his playing (even on up-tempo tunes) a lyrical quality and that touch of ear candy that is very effective. Other recent Bernstein projects include a Thelonious Monk tribute disc and a solo recording done “live” @ Smalls Jazz Club in N.Y.C. “That’s the only way to get through life” the leader has said “to be loose and relaxed, and to let things happen.” The whole quartet has followed Bernstein’s lead on that thought, and things happen indeed throughout this wonderful new recording.